The government chose to borrow ₹2.88 trillion, or 48% of its annual target, in the first half of this fiscal year. New Delhi: The government will cut borrowings by ₹ 70,000 crore in the current fiscal year, signalling its confidence in keeping the fiscal deficit under control. Economic affairs secretary Subhash Chandra Garg said on Friday that gross borrowing will be at ₹ 2.47 trillion for the October-March period. The borrowing programme will be spread across 21 weekly auctions of government bonds, ending the calendar on 8 March, Garg added. The cut in borrowings will be matched by a reduction in buyback of government securities and enhanced flow from small savings schemes. The government has also decided to introduce retail inflation-indexed bonds during the second half of the fiscal. “Since this will be a new instrument, we expect one or two issues to be made by end-March." 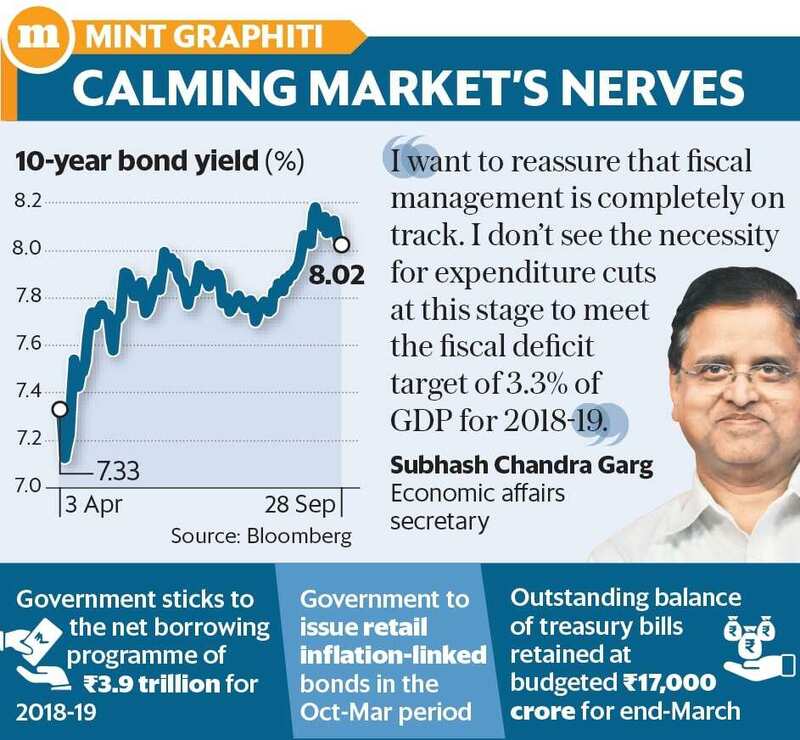 While announcing its borrowing programme of ₹ 2.88 trillion for the April-September period, Garg had said in March that overall borrowing during the financial year will be ₹ 50,000 crore less than the budgeted ₹ 6.05 trillion. With a further reduction of ₹ 20,000 crore, planned gross market borrowing in 2018-19 stands at ₹ 5.35 trillion, which includes buybacks and repayments, compared to the ₹ 5.99 trillion borrowed last year. Garg said the government does not anticipate any fiscal slippage in 2018-19. “We believe revenues will be as per the budget estimates. Expenditure programme is also on track even after including expenditure related to higher minimum support price and Ayushman Bharat." Small savings schemes will provide an alternative which should help the government avail a higher net amount from the National Small Savings Fund (NSSF), compared to its target of ₹ 75,000 crore in 2018-19, Garg added. The finance ministry on Thursday increased interest rates on small savings schemes, which are linked to the yields of government securities, or G-sec, by 30-40 basis points for the quarter starting 1 October. This was largely in line with the uptrend displayed by G-sec yields of various maturities during the trailing three-month period. Finance minister Arun Jaitley earlier this month sent a strong signal of fiscal prudence by committing to the targets for fiscal deficit as well as capital expenditure in a pre-election year. “Government is confident of meeting the 3.3% (of GDP) fiscal deficit target. So far, the government has spent 44% of the budgeted capital expenditure till August 31 and there will be no cuts in capex by the end of this year," Jaitley had said. Aditi Nayar, principal economist at Icra Ltd, said that with the uncertainty regarding the size of the second half market borrowings out of the way, bond yields going forward will be guided by the outlook for inflation risks such as crude oil prices and the rupee, the pipeline of open market operations, as well as the emerging information on the balance of various fiscal risks. “The market would continue to monitor the likelihood of meeting the budgeted targets for revenues related to the goods and services tax, dividends and profits, and disinvestment, and assess whether the outlays required for revised minimum support price, the NHPS, fuel and other subsidies, and bank recapitalisation would prove to be adequate," she added.